In 1999 I brought my first computer. I had a computer nerd boyfriend and was in my second year of university. I’m trying to recall what I did for the first year of uni when I had to do essays. I guess I sat in the computer labs on campus. I remember sometimes they were full and you had to sit and wait. They were Windows running beige boxes in uninspiring rooms that smelled a little bit funny. Anyway, in second year my boyfriend told me about these great new computers that were coming out. They were top of the line, easy to use and attractive to look at. I pretty much trusted his opinions on computers and stuff so I took his word for it. That is how I became an Mac girl. I ended up with a pink (Strawberry) G3 iMac. Gosh it was purty. 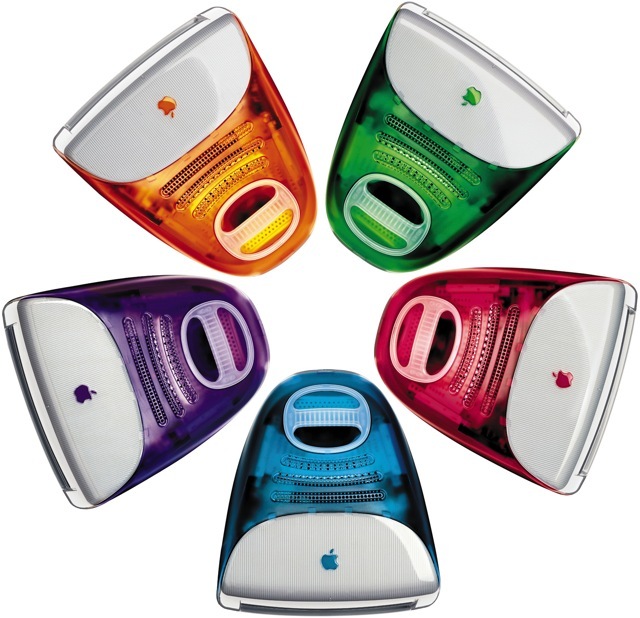 It had a round mouse, compact keyboard, built-in speakers and CD-ROM. I got an external 31/2 inch disk drive as at the time that is what everyone used for transferring data! That’s kind of funny when I think about it now. I remember going back to computer labs to print my work in mid-1999 and noticed they were all pretty much empty as a) the uni had opened a gazillion more labs (where were you a year ago?!) and b) Suddenly computers had become more affordable (and really cute). This is also where my vast MP3 collection began. I “ripped” a whole heap of CDs, downloaded a few (this was in the time of dial-up internet, so that wasn’t really a good option). I still have all of those MP3’s in my 20GB collection of today. I can’t actually think how I got them off my iMac, though. No CD burner in that time….hmm. Mystery. I had my computer set to automatically start-up in the morning, sort of like a clock radio, which meant it would automatically start playing whatever CD was in the drive. Mostly it was The Sundays Static & SIlence. When I used to go home for the weekend or to my boyfriends, I would simply put it in the back seat of the car. What a revolution! When I finished uni and headed to Japan, I sadly couldn’t take my iMac with me. Not to worry, about a year into my stay I decided to buy a iBook. 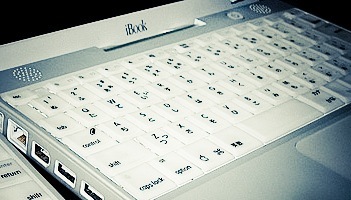 It was beautiful and white and because I bought it in Japan it had Japanese script on the keyboard!! Upon returning to Australia and getting a job in a government high school I eventually gave my laptop to my little brother and got a newer model “work” laptop. By the time I left work for maternity leave my laptop had been upgraded AGAIN and I was well and truly addicted to Mac. What’s a girl to do when she has spent almost 10 years using only Macs and suddenly finds herself without one? She goes and buys a desktop Mac for at home with the kids. Fours years on my desktop is still going strong. I have never had a virus, I never find newly installed software messes up other software. My computer doesn’t download updates every 5 minutes. It works. Consistently. I know that someone is going to post a comment telling me all the downfalls of Apple. There is a polar reaction to Macs. I get it . Me? 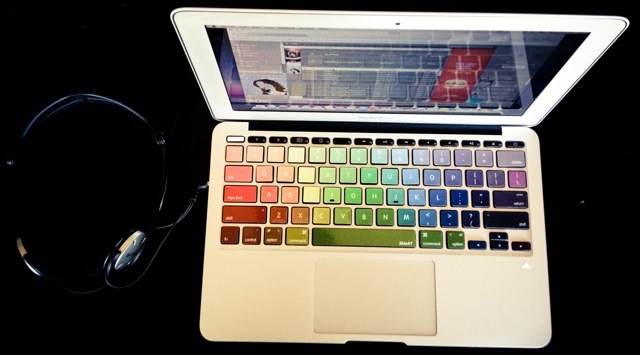 I love Macs. They have never failed me. When I go to buy nerd-gadgets, I go straight for the Apple gear because it all works together and it has never given me stress. My husband, when I met him, was one of those staunch anti-Macs. Yet a year and a bit ago, when work said they would buy him a new laptop he ordered a MacBook Air. What a shock! I’ll admit, he ran Windows on it (oh, the blasphemy!! ), but still, he knew that he was going to cause a stir amongst all his friends. And then his phone contract came up for renewal and he decided to get an iPhone! Ha! I think all those years of me telling him how much I loved my Apple gear wore him down. Sort of. In June this year MY phone contract came up for renewal. My husband proposed that I take his iPhone and I order a different phone for him. He he. The beginning of his un-Appleing. Then, at his new job they got him a new laptop, so he ordered a Toshiba and said I could had the “old” MacBook. Is this the first time ever some one has gone BACK to the dark side? I’m not going to question it too much. 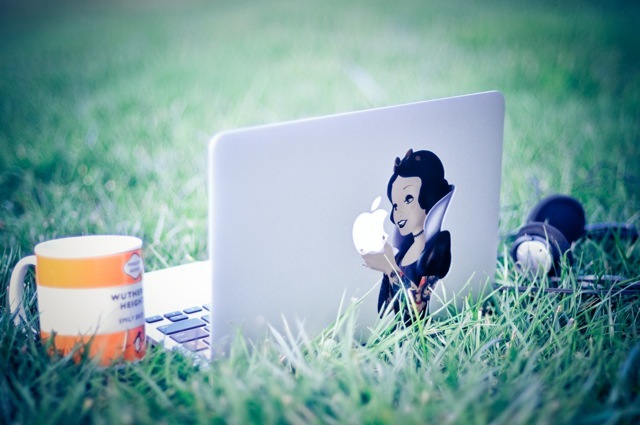 I got a new iPhone out of it AND a spiffy new laptop that allows me to go sit in the grass and blog, or in a cafe that has free wi-fi. Or in bed. Gosh I forgot how much I love laptops. Also, I found awesome stickers to put on it. Fun. I am definitely an Apple girl!! I think anyone who does not adore them is a little strange …….